It appears that there were two distinct periods or eras in the history of the Army of Flanders and the Eighty Years War. The first one lasted roughly from 1567 to the signing of the Twelve Years Truce in 1609. This first Army of Flanders functioned with the regimental and professional structures inherited from earlier periods and those introduced by the Duke of Alba during his administration. It was an army open to tactical innovation, with a remarkably meritocratic official ideology and structure of promotion and that was, all things considered, rather successful, both tactically and strategically. At the very least it was able to rescue and hold the Southern Netherlands for the King of Spain in the midst of widespread revolt and foreign attacks and to intervene effectively in the French Religious Wars. The second Army of Flanders spans the fifty years between 1609 and the conclusion of the Treaty of the Pyrenees in 1659 and its most representative figure is the valido of Philip IV, the Count-Duke of Olivares, who greatly influenced its standards and structure during the last half of the war. This army was highly divided among nations, ranks and factions and ultimately failed to adapt too many of the new trends in warfare known in the historiography as the Military Revolution. It is the army whose remarkable decline in combat effectiveness led it to a major string of defeats in the last two decades of the war. Although the Army of Flanders could still be an effective siege and relief force up to the final years of the war, the battles of Rocroi, Lens, Rethel, and the Dunes demonstrated its inability to vanquish the French in the open field. The French, like the Dutch before them, had begun to adapt their armies to a more modern tactical and organizational model while the high command of the Army of Flanders busied itself in perennial disputes over precedence and status. The process of aristocratization that had begun late in the reign of Philip II, gathered speed in that of Philip III and became institutionalized under the Count-Duke of Olivares, had seriously damaged the tercios. Its fractious high command was increasingly dominated by dilettantes (courtiers or diplomats), not by career soldiers. Its Infantry Maestres de Campo were blue-blooded and brave but could not effectively maneuver their units, much less lead larger detachments as they had done under Alba; its untrained cavalry officers showed little fi ghting endurance and its artillery was often inadequately equipped and deployed or not used at all as in the Dunes’. As Alba, Olivares and others realized, the Spanish monarchy, a vast and heterogeneous empire spanning the globe, relied to a very high degree directly and specifically on cabezas or leaders as well as on the structures that facilitated their proper functioning. Though her rivals enjoyed more advantageous geography, larger populations and richer agricultures and economies, the secret to the remarkable staying power of imperial Spain was her development and mastery in the late fifteenth and early sixteenth centuries of singularly efficient structures of authority and administration, transport and supply, diplomacy and war, and the training and appointment of dedicated personnel capable of making them work. Thus she could ill afford their deterioration, even a relative one, especially at time of general economic and political crisis and population decline like the seventeenth century. In other words, the Spanish army in the Netherlands could not be allowed the luxury of imitating its competitors and deviate from strictly pragmatic and tangible military objectives in a baroque search for luster. To be sure, the process of military aristocratization was common in greater or lesser degrees to almost all of early modern Europe but, as in the general seventeenth century crisis, it was probably the Spanish empire that experienced its most severe consequences. There are suggestive parallels between this process and the social evolution of early modern Spain and Western Europe. The reinforcement of noble privilege in the Army of Flanders may be considered an episode in that famous early modern “crisis of the aristocracy” that Lawrence Stone described in the English context and that Spanish historians identify also in Castile.4 Recently, for instance, Yun Casalilla has argued that relative distancing between the Crown and the aristocracy that prevailed in the sixteenth century came to an end in the seventeenth as the central government sought to marshall the resources of the country’s elite and the nobility looked to the King for a variety of modes of financial relief. This process led to a certain “refeudalization” not only of Castilian society but also of the Army of Flanders. However, it must be kept in mind that military service was not a money-making proposition for the Spanish aristocracy. In the seventeenth century the Spanish nobility went Flanders only with great reluctance and its organizational and tactical impact on the combat effectiveness of the tercios was severe enough to be obvious even to the most enthusiastic advocates of a socially prestigious high command. It is thus hard to see what sort of military or social advantage either Crown or nobility derived from this aristocratization. 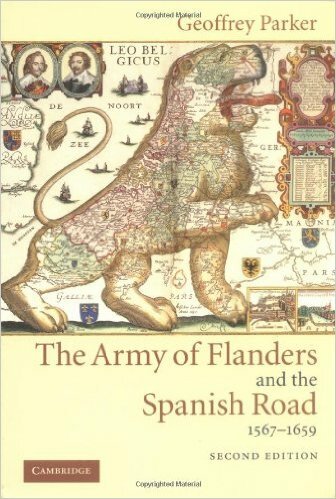 Although nowadays historians almost routinely minimize or simply ignore the importance of military factors in the erosion of Spain’s power and influence, the trajectory or “road” of the Army of Flanders returns these issues to center stage. The deterioration of the combat effectiveness of this army, the Spanish monarchy’s most powerful military weapon, played an obvious and crucial role in the outcome of the Eighty Years War and in the overall erosion of Spanish power in the seventeenth century. The number and importance of fortified places in the Netherlands lost through internal discord, indiscipline or incompetence in the leadership of the tercios is quite high; certainly more enclaves were lost due primarily or even exclusively to those factors than to lack of money or soldiers. Since the 1590’s, when internal struggle among the army’s nations allowed the Dutch to consolidate their position, to the late 1620’s and early 1630’s when another flare-up of intramural disputes imperiled Spanish rule in the Netherlands, to the critical 1640’s when the monarchy was fighting for its very survival, the Army of Flanders failed to perform according to expectations or to its levels of funding and repeatedly spoiled the plans of Madrid’s diplomats and strategists. In the last years of the war Spain’s failure to profit from the Fronde Revolt in France had a great deal to do with the growing inadequacies of its principal military instrument in the Low Countries. Obviously, an efficient Army of Flanders fighting on only one front could have soon exploited French political and social turmoil to great advantage; Spanish victories in the north would have not only relieved the pressure in the Catalonian and Mediterranean fronts but might have brought about favorable peace treaty and even perhaps a shift in the European balance of power in favor of Spain. The Army of Flanders remained one of the Spanish monarchy’s most important armies after the Treaty of the Pyrenees but on the larger European field it cast a shrinking shadow. The army’s internal problems certainly did not go away and the Spanish aristocracy continued to demonstrate a marked reluctance to serve within its ranks. However, these perennial shortcomings were now compounded by the rise of a more numerous and much more powerful French military under an aggressive Louis XIV. Soldiers were still recruited in Spain and elsewhere and troop levels remained relatively high in the 1660’s and 1670’s (roughly 53000 soldiers in both 1668 and 1675 during French invasions) but they could not match the French build-up from the late 1670’s onwards. By the early 1690’s the tercios were reduced to less than 20,000 soldiers and even further, down to 8000 troops, by the end of the century. In reality the once protagonistic Army of Flanders had become an auxiliary force in a number of major Allied defeats in the Nine Years War (1689–1697). Although it was not a uniformly bleak picture, as the foundation of Europe’s first military academy in 1675 suggests, the formal abolition of the tercio as an organizational and tactical unit during the War of the Spanish Succession in 1704 and the adoption of the French regimental model was indicative not only of the changing dynastic direction in Madrid but of the obsolescence and irrelevance of the old Army of Flanders. Thus traditional weapons such as the pike were finally abandoned. This entry was posted in Spain, Wars by MSW. Bookmark the permalink.